← Think of Kristin Henry when you eat this Easter. Day 13 of her Site C hunger strike. “We’re living in a world that has almost more polluted land than not, and more polluted water than not, and I seriously get worried looking forward 20 years at what it might look like….” she said. A well-known Surrey based political commentator and blogger has been hacked online. 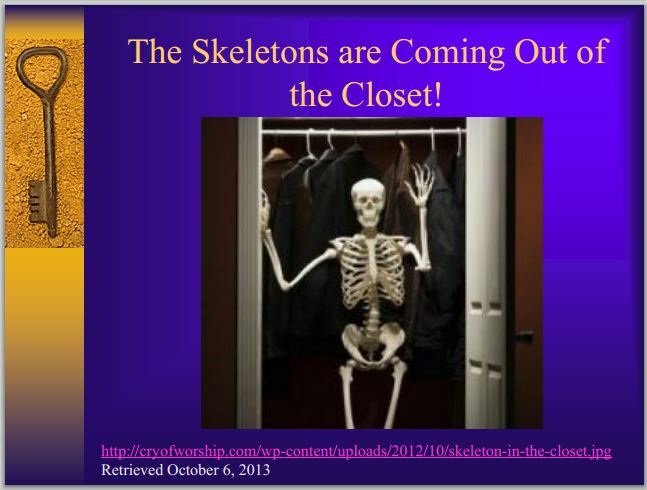 Laila Yuile says her Twitter account and blog have been hijacked. It happened last night after her last blog post about the Site C dam. Someone who claims to be from the group “Anonymous” appears to have hacked her twitter and her website. But she doesn’t think it’s anonymous. It’s nothing short of nasty comments. She doesn’t know if she can recover any of her work. Yuile says she thinks it’s a personal attack because of the comments written on her account. Was Cached: Bald Eagles break injunction,build nest in the path of Site C clearing by Laila Yule, March 23, 2016 4:48 PM, No Strings Attached : Laila Yuile on politics and life in B.C. I was in the courtroom the day that BC Hydro was granted their injunction to force the land stewards camp at historic Rocky Mountain Fort. As I listened to the justice give his preamble and reasons for granting it,one knew what the result was going to be. He listed what he could and could not consider within the confines of the law for the purposes of the application, and even acknowledged there were many compelling and persuasive arguments the construction of the dam should not proceed at this time. That statement surprised me as it did others and was akin to rubbing salt on a raw wound, because like the land stewards of Rocky Mountain Fort, I too believe construction of the dam must be halted. Incredible,isn’t it? Rich in wildlife, of traditional medicine and sacred land enjoyed and used by First Nations,explorers and settlers for hundreds of years. Until now. This is the view of Rocky Mountain Fort, after the injunction. And here is a closer look at the devastating clearing that when viewed for the first time, brought tears. A local ongoing art project in Surrey called ‘I Grieve’came instantly to mind : I grieve over the loss of these trees and this land and what that loss will be for generations to come if one of the court cases doesn’t stop it. 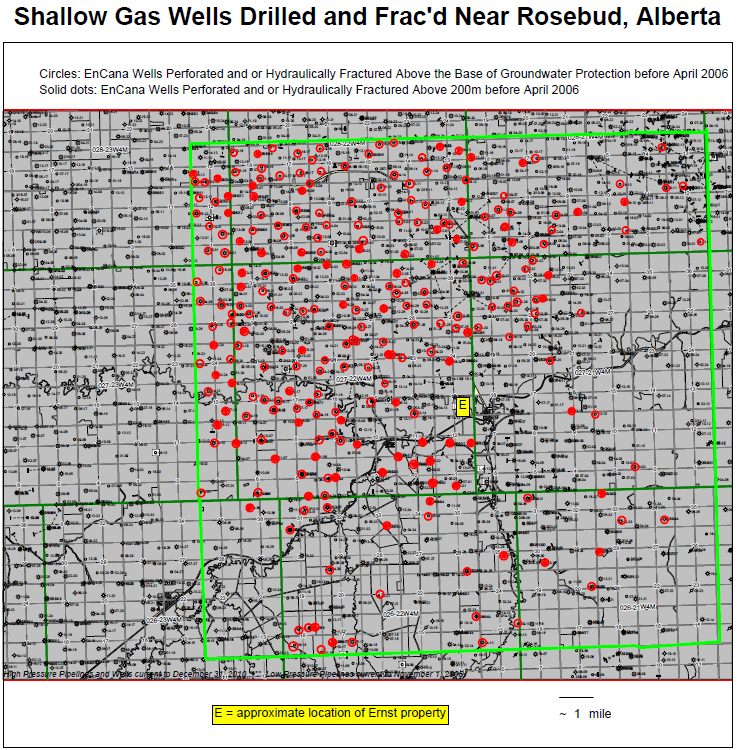 So much for treaty rights. So much for peoples lives. It is thought that this is the same bald eagle pair whose nest was destroyed last fall in clearing that was decried by locals at that time,because an eagle was photographed at the nest right before it was taken down. That Arlene can speak with grace and humour in a situation that is anything but funny, speaks to the strength and quality of her character. That the bald eagles have chosen to build in the path of clearing for site C, some might say is divine intervention. Across cultures and faiths, eagles hold significant spiritual significance, particularly for First Nations and Native Americans. BC Hydro has committed to a 300 meter buffer for all active nests during Site C construction so this nest is safe according to their link. And, this site is now documented and actively being watched so it doesn’t “fall down due to the backwatering caused by the channelization and diversion of the river” as per the BC Hydro link embedded above. Legal counsel for SNC Lavalin chairman Gwyn Morgan, issues cease and desist letter to website bearing the same name by Laila Yule, April 18, 2016, No Strings Attached : Laila Yuile on politics and life in B.C. Documents forwarded to me anonymously yesterday, indicate that a law firm in Calgary, Bennett Jones LLP, has issued a legal letter to Tucows Inc, to shut down the website www.gwynmorgan.ca, on behalf of their client, Gwyn Morgan. Upon opening this webpage, the viewer is immediately assaulted with an image of a demon under the broad caption “Gwyn Morgan – The Devil is in the details -“. This imagery alone constitutes a defamatory publication. It suggests that Mr. Morgan is analogous to a devil in hiding. Yes, he does columns for the Globe and Mail. Some generic blanket coverage SNC in media but none for SNC in BC hello vsun/prov.charges may be grounds for breaking contracts if behaving illegally.?yes/no. ?censored inBC..? any charitable Fraser insititute comments. Bennett Jones and Gwyn Morgan demanded (and violated a Canadian’s Right to Freedom of Expression guaranteed under the Charter?) 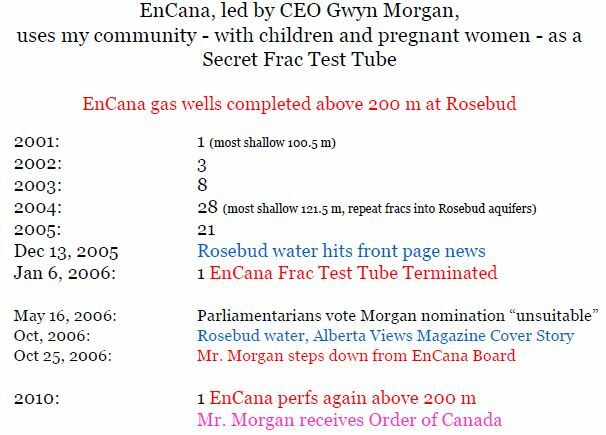 but do nothing to fix Encana illegally fracturing Rosebud’s drinking water supply and contaminating it, and secretly fracing hundreds more gas wells into the fresh water zones around the community while Gwyn Morgan was CEO of the company? Right before Christmas, I received a letter in the mail from Tyler Shandro, a lawyer from the Calgary-based law firm Walsh Wilkins Creighton LLP, representing Alberta Premier Edward Stelmach. The letter also states that because there are advertisements placed on this blog, Premier Stelmach “is entitled to the amount he would reasonably have received in the market for the permission to use his name.” This makes me wonder how much the owners of a local Edmonton business paid to use Premier Stelmach’s personality last Halloween or how much Rick Mercer paid to use the domain name of another Alberta political personality. For the majority of the time I have owned edstelmach.ca, I have had the domain name forward to this blog. A week before I received the letter from Premier Stelmach’s lawyer, I changed the forwarding to the wikipedia biography of another Alberta Premier (who also probably would have not thought to register his domain name). As someone who has never shied away from criticizing the 36-year old Progressive Conservative government, I have always faced harsh criticism from those who don’t appreciate the views espoused on this blog or agree with my political beliefs. I accept this reality. 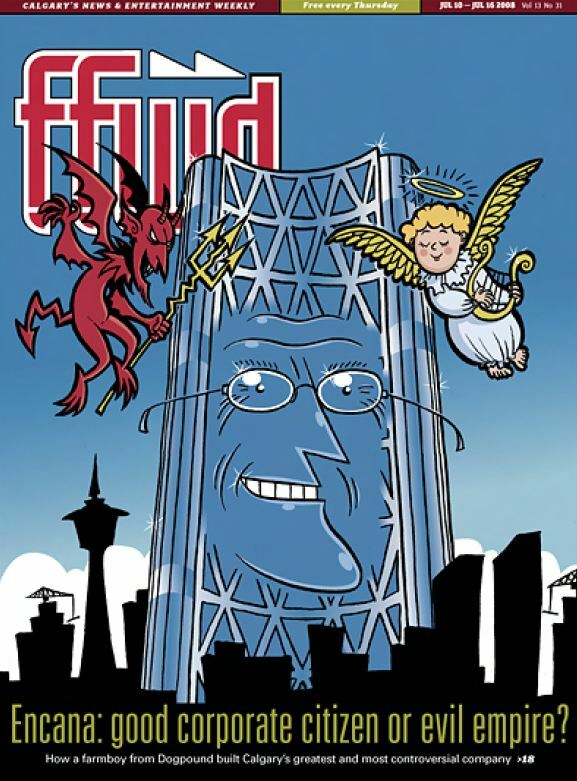 Is that Gwyn Morgan drawn in the Bow Building with the Devil by his side on Fast Forward’s 2008 cover above? Why did Bennet Jones not demand the link to the Devil and cover drawing removed, and for Fast Forward to hand over it’s website to Gwyn? 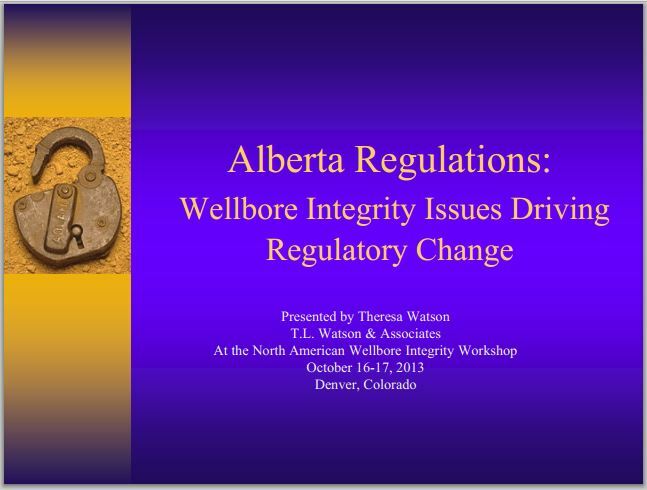 Devils & Skeletons rule AER’s “World-Class” “Best in the World” regulated oil and gas industry in Alberta?